For other TV shows with the same name, see 101st Proposal (disambiguation). 101st Marriage Proposal is a "Beauty and the Beast" story starring Takeda Tetsuya (Virgin Road, 3 nen B gumi Kinpachi Sensei) as a down-on-his-luck man who has gone through 99 omiai (arranged dates with the intention of marriage if the date goes well). Not particularly smart, nor handsome, nor rich, he is a man who cannot lie and of course, has a heart of pure gold. On the 100th omiai, he meets Kaoru (Asano Atsuko), an extremely beautiful and talented cellist who can't forget her dead fiancee. Ep 05: Can You Marry Without Love? Ep 11: The Goddess of Love! One of the dramas that helped create the golden age of Japanese dramas, 101st Marriage Proposal has a great melodramatic story filled with many laughs. Takeda Tatsuya puts in another wonderful performance, this time as a very funny but unfortunate man. Asano Atsuko puts in a decent performance, but nothing particularly great or special. Featuring a strong supporting cast with Eguchi Yosuke (Under One Roof, Tobosha, Tokyo Love Story) as Tatsuro's otaku brother, Junpei, and Tanaka Ritsuko as Kaoru's sister, Chie. They both lend a lot of comedic support and help propel the obligatory love triangles. This drama also features a young Ishida Yuriko as Junpei's love interest, Ryoko. The casting is strong overall. The script is well written, using quite a few puns and word plays, as well as creating situations where one roots for the hero to triumph over the latest obstacle in his path. Filled with some of the most memorable lines in jdrama history, this is a drama that launched the career of several of its stars, as well as the career of writer Nojima Shinji (Under One Roof, Kou Kou Kyoushi, Pride). This drama shouldn't be missed, as it includes lots of humor and the sappy bits, too. You can see a lot of dramas taking off of this formula, but none have quite succeeded in the same way as this one. The acting of Takeda Tetsuya differentiates it from most of the idol dramas out there. Great music, with the two main themes playing throughout. "Tristesse" plays whenever Kaoru has a flashback, and does well to represent her feelings about her dead fiancee. A few upbeat themes are included mostly for interactions between the two brothers and between Junpei and Chie. 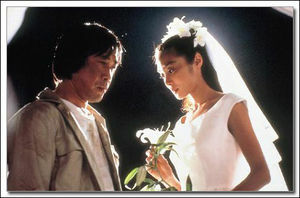 "Say Yes" plays for the endings, and is considered to be Tatsuro's theme. Cinematography and direction is sort of hit and miss. The director plays around with a handheld a lot, but it introduces a shakiness that is sometimes jarring. Still, excellent use of film technique in giving the flashbacks a unique look. Also, one of the best scenes involved the use of lighting and music that just hits you. This page was last edited on 29 April 2016, at 04:27.